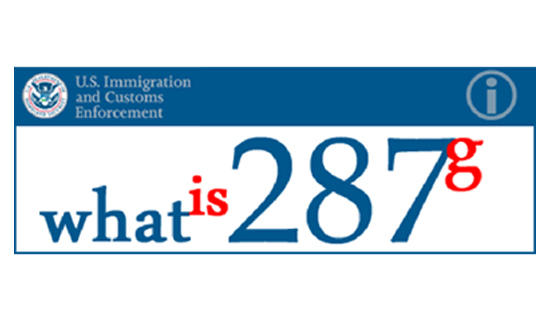 When 287(g) came along it seemed like a reasonable approach to dealing with illegal immigration. The federal program puts U.S. Immigration and Customs Enforcement agents in county jails and trains county employees to question inmates convicted of certain felonies in order to determine immigration status. But some cities and counties are reconsidering their involvement in the program due to issues like cost, community relations and even legal liability. According to an article in the Los Angeles Times, L.A. County supervisors are about to make a decision on whether to extend the a controversial program. Critics of the program say the problem with 287(g) has several parts. Opponents say the program blurs the line between federal and local law enforcement in addition to exposing cities and counties to legal liability. But another factor is cost and resources. Local law enforcement agencies have seen budgets slashed, position lost, and overworked cops leaving departments for better paying jobs at other agencies. The added responsibilities, costs and manpower required by 287(g) only add to those problems. Unlike local law enforcement agencies, federal law enforcement agencies have seen almost nothing in the way of reduced funding and in some cases their operating budgets have increased. But supporters of the program like Supervisor Gloria Molina call 287(g) a critical public safety tool. The vote in Los Angeles takes place as state and local governments across the country are taking a second look at the program and their relationship with federal immigration officials. The number of law enforcement jurisdictions participating in 287(g) has decreased from 75 to 35 recently. One of the reasons for that change is that ICE frequently asks local law enforcement officials to hold “potentially deportable” inmates after they’ve served their prison terms. But like a lot of issues the liability factor is huge for municipalities that just can’t afford massive payouts should someone screw up. Last April courts ruled that an Oregon county was liable for damages after it held an inmate beyond her release date. This opens a major can of worms for those participating in 287(g). Dozens of cities and counties across the country, including Los Angeles County, announced they would stop honoring ICE hold requests altogether. Immigrant advocates hailed the announcement at the time, but now say L.A. County has not implemented the new policy and continues to hold some inmates past their release date. And a drain on resources for municipalities and agencies is another factor. Some have said that the problem with 287(g) is not the idea but the fact that local law enforcement winds up bearing the cost of a very expensive federal law enforcement function. According to some groups like the ACLU the percentage increase in ICE detainments in Georgia between 2007 and 2013 was 17,169% in ICE detainments in Georgia between 2007 and 2013. That eye-popping figure comes from publicly available law enforcement records and databases.